We are Closed Sunday and Monday. Shipping will resume Tuesday unless its a holiday, then shipping will resume Wednesday. 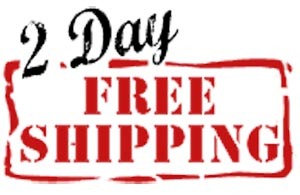 We are offering FREE Expedited 2-day shipping on select items. Just look for the symbol you see to the left. If you do NOT require the expedited 2-day shipping, we will credit you back with a gift certificate for the difference. Gift certificate will be made invalid if the product is returned. If product is returned, we will deduct the cost of the expedited shipping from your refund. Adding other products to the same order will affect the shipping prices displayed at checkout. We will try to ship all products together at the discounted rate, or they may ship separately via free ground shipping. International customers will receive a flat shipping rate for these items.